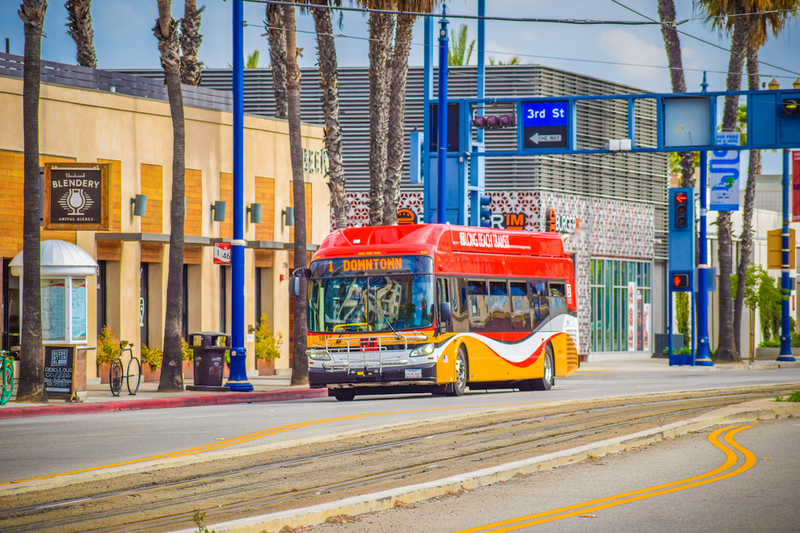 Long Beach Transit will soon offer public transportation to a score of new locations, including UCLA, Las Vegas, and the Coachella and Stagecoach festivals. Trips to UCLA (which include stops at Kinross Avenue and Veteran Avenue; the UCLA Medical Center; and Gateway Plaza) will launch April 1 and offer riders a commuter bus directly from Long Beach to Westwood. The bus will run Monday through Friday beginning at Bellflower Boulevard and Spring Street at three times: 5:15 a.m., 6 a.m. and 6:45 a.m. After each of these stops, they will make another stop at the Willow Blue Line Station roughly 20 minutes later: 5:35 a.m., 6:20 a.m. and 7:05 a.m.
Returns will occur at 4:20 p.m., 5:20 p.m. and 6:20 p.m. from Gateway Plaza. This route will help serve students, many of whom live in Long Beach but work in Westwood and rely on undependable or taxing vanpools. The commuter bus to UCLA is a pilot project created through a partnership between Long Beach Transit, the Westwood Improvement District and UCLA. UCLA will be offering subsidies for employees when it comes to scoring a monthly pass. When it comes to Vegas and Coachella, Long Beach Transit has partnered with Germany-based FlixBus as the European company expands its presence in the U.S.
FlixBus will kick off its partnership with Long Beach Transit by focusing on Vegas. Its first trip will come this Thursday, March 21 at the transit mall on First Street in Downtown. Come April, the bus will offer service to Coachella and Stagecoach. FlixBus has a demand pricing model: The more people that sign up, the cheaper the ride and the more frequently it will take place. For now, FlixBus is still in the process of determining demand, so a specific schedule isn’t yet set. For information on tickets to Las Vegas and Coachella, click here.